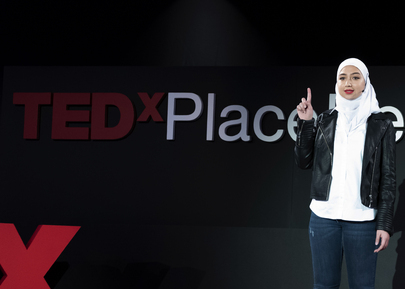 TEDx Event in Geneva: "Place des Nations Women"
Maya Ghazal, an aspiring pilot, speaks at TEDx Event "Place Des Nations Women" in Geneva on the theme of women’s empowerment and gender equality. Maya Ghazal is a 19-year-old Syrian refugee from Damascus who arrived in the UK in 2015. She is now studying Aviation Engineering with Pilot studies at Brunel University London.